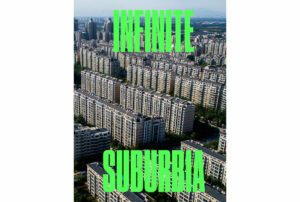 Infinite Suburbia is produced by MIT’s Center for Advanced Urbanism and edited by professor Alan Berger (MIT and AHO), geographer Joel Kotkin, and environmental urbanist Celina Balderas Guzman. In their chapter, Espen Aukrust Hauglin and Janike Kampevold Larsen explains how nature and recreation were crucial in the development of Oslo’s satellite towns, in the form of path systems that create a transitions between the city and surrounding forest. The American Society of Landscape Architects (ASLA) found Infinite Suburbia “sprawling, often beautiful, and a bit relentless”.